Finally, number 12 is done. One for each of the 12 Days of Christmas. I had them all hanging in the window and they look great, but now five of them have melted away. I think I had better get some more in the window so it doesn't look so bare. My sister and her family was here today for Christmas. After the snow storm yesterday they were the only ones brave enough to attempt the trip. Her son and daughter along with their five children were her. That along with my dog made for an interesting afternoon. We had a great time I enjoyed seeing the kids. Gramps play Euchre with my niece and nephew and they had a great time playing. It seems gramps won two of the three games but then they didn't want to disappoint him by wining all the games. 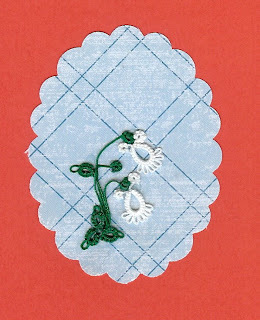 I have another little project I was working on and have at least one of the flowers put together and glued to a card. I am pleased with the turn out and it is a great way to us e odds and ends of thread on your shuttle. I have one more to put together and I think I may used a different background paper to see if I like it better. 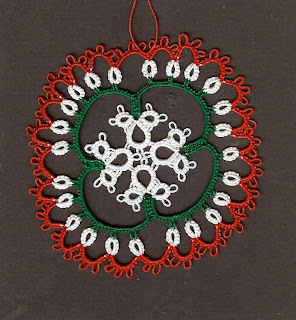 This is from my DMC Festive Tatting book. It is the begonia notepaper pattern. It could be added the front of a card or to the corner on some notepaper. It would make a nice gift for someone who likes to send cards or letters. The motif you made in Christmas colors is lovely! I guess I don't understand...how did 5 tatted ornaments melt away!? I'm sure there's a story there, but I don't get it. LOL!